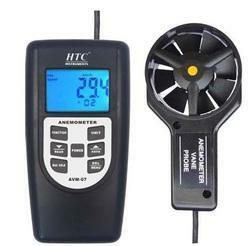 Providing you the best range of amprobe anemometer, cup anemometer, lutron anemometer 4201, digital air flow meter, htc anemometer avm 07 and hot wire anemometer 4204 with effective & timely delivery. Air Velocity or volume, Relative Humidity and Temperature. or the added feature of data logging up to 2400 data points. User sets the measurement interval time from 1 to 200 seconds. USB interface cable, Software CD, hard carrying case and usermanual. 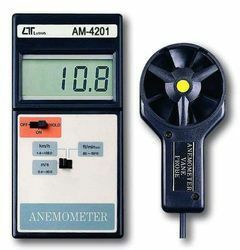 Anemometer unit m/S, Km/h, FPM, mph, Knot. Barometer unit hPa, mmHg, inHg. Temperature measurement with , unit. Durable, long-lasting components, enclosed in strong compact ABS-plastic housing. 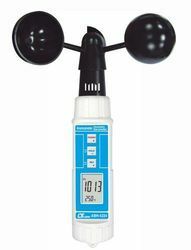 The portable anemometer provides fastaccurate readings with digitalreadability and the convenience ofa remote sensor separately. Multi-functions for air flowmeasurement:m/s, km/h, ft/min, knots. Low-friction ball-bearing designresulting in accuracy at both highand low velocities. Conventional twisted vane arms,always a source of unreliability havebeen eliminated. Wide applications: use thisanemometer to check air conditioning& heating systems, measure airvelocities, wind speeds,temperature...etc. Thermistor sensor for temp. measurement,fast response time. Air velocity : m/s, ft/min, km/h, knots. Air temperature : C degree, F degree. 3 air flow mode : Instant, 2/3 Vmax, Average. Separate probe, easy for operation of the different measurement environment. Large LCD with dual display. Used the durable, long-lasting components,including a strong, light weight ABS-plastic. housing case. Wide applications: use this anemometer tocheck air conditioning & heating systems, measure air velocities, wind speeds,temperature...etc. Microcomputer circuit provides special function & offer high accuracy. 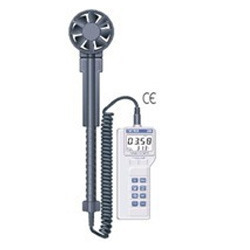 Thermal anemometer, available for very low air velocity measurement. Slim probe, ideal for grilles & diffusers. 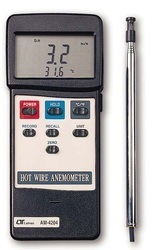 Combination of hot wire and standard thermistor, deliver rapid and precise measurements even at low air velocity value. 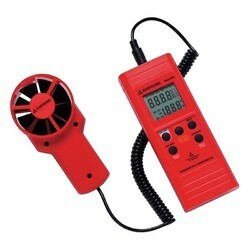 Super large LCD with dual function meter's display, read the air velocity & temp. at the same time. Operates from 6 PCs UM-4 batteries. 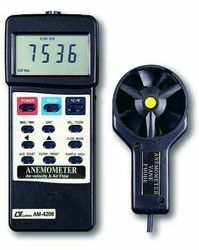 The portable anemometer provides fast,accurate readings, with digital readability and the convenience of a remote probe separately. Multi-functions for air flow measurement :. m/s, km/h, ft/min, knots. mile/h. Build in temperature ℃, measurement. Simultaneous display of air flow in CFM / CMMor air velocity plus ambient temperatures. Combination of hot wire & standard thermister, deliver rapid & precise measurements event at low air velocity. Wide range measurement of air velocity, fast response time. Multi-functions for air velocity measurement: m/s, km/h,ft/min, knots, mile/h. Infrared thermometer measures remote surface temperature to 932°F (500°C) with 8:1 distance to spot ratio and laser pointer. Super large LCD with dual function display, read the airvelocity & temperature at the same time. 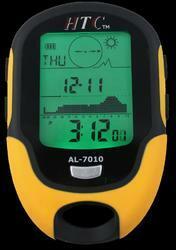 Real time data logger, built in clock(hour-min.-sec., Year-month-date). Data hold and record / recall maximum, minimum and average reading. Dimensions:184 (L) X 70(W) X 40(H)mm (7.24 X 2.75 X 1.57 inch). Telescope probe : approx. 1800mm (70.8 inch) include wire rod. Airflow measurements in heating system. By knowing the cross section area of the Duct , the total air flow (cfm) can be calculated . Simultaneously display of both temperature and wind speed. 4 Digit LCD Backlight Display. Measurement Units : knots, mph, Km/h, m/s, ft/min. Air velocity average reading upto 8 multiple points. 2 meters coiled cable and mounting nut (1/4” x 20) for long extension. Weight : Approx. 390g. Including battery and probe. Temperature measurement with ℃, unit. Display LCD size : 28 mm x 19 mm. Sensor Anemometer Van probe with low friction ball bearing design. Data Hold Freeze the display reading. Memory Recall Maximum & Minimum value. Sampling Time Approx. 1 second. Operating Temp. 0 to 50 ℃. Operating Humidity Less than 80% R.H. Weight 182 g/ 0.4 LB. 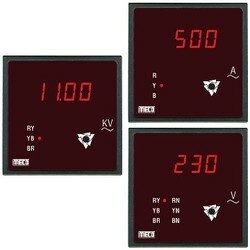 AC Voltmeter : 3 Phase, 2 Element, 3 Wire or 3 Phase, 3 Element, 4 Wire.